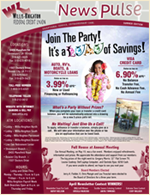 Are you interested in securing a loan with your money at Willis-Knighton FCU. Your savings account or share certificate may be used as collateral. These types of secured loans may be used for any purpose, giving you access to a quick approval process. See Rates for our current rates.